The Christian Science Monitor described the Dodgers' Dominican baseball academy in 2002. It had diamonds, dorms, a cafeteria and an armed guard. "This is the way to play ball," Rafael Rijo, the academy's outfield coach, told The Monitor, "away from all the distractions, away from the streets and all the people." Rijo himself got out of the Dominican to the United States as a player. He saw six total seasons, but never saw the majors. He has since gone on to a career as a coach and a scout - and see his son Wendell Rijo off to the pros. Rafael Rijo's career began in 1988, signed by the Dodgers as a free agent out of the Dominican Republic. Rijo started in the rookie Gulf Coast League. The outfielder hit .259 over 60 games, with 13 stolen bases. He moved to short-season Salem for 1989. He hit .228 over 73 games there. 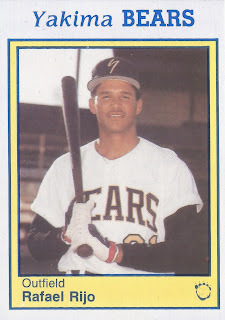 He played 1990 at short-season Yakima, then 1991 at high-A Vero Beach. He went 8 for 13 in a May 1991 series. He hit .233 overall for Vero Beach, stealing 23 bases. Rijo moved to the Expos and single-A Rockford for 1992. He hit .262 there over 105 games, stealing 32. After two seasons away, he played one last campaign in 1995 between high-A Port Charlotte and independent Laredo. Rijo then went on to his new career as a scout and a coach. He served with the Dodgers in 2002 and a scout in 2012. In 2017, he worked in the Dominican with the Royals.